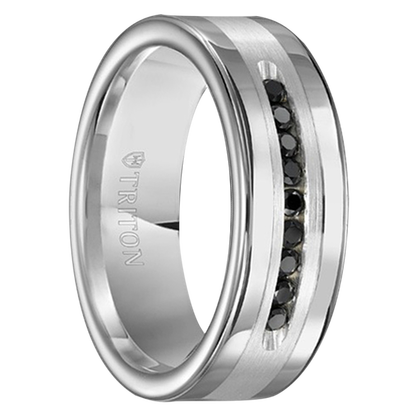 PLEASE NOTE: When you purchase any of our Exotic Inlay wedding bands, the J095C (click here to view this ring) will be sent to you before we place your order to make sure that the size you have ordered is accurate. Sometimes we need to send more than one sizing ring to ensure accuracy, and we are happy to do so. This service, with the shipping, is free. Questions? Please call 801-755-1661 or email ringsales@live.com. 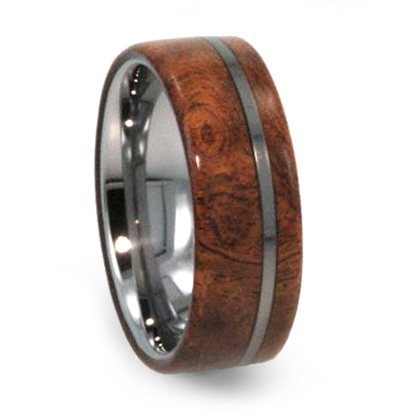 8 mm, with 2 mm Exotic Ironwood Burl Hardwood, 1 mm Tungsten Pinstripe, 5 mm Exotic Hardwood Design, with Comfort Fit. More expensive than all other woods, exotic hardwoods have the most distinctive grain patterns of any wood. This is a certified Exotic Wood Inlay with NO SEAMS, NO VENEERS, and NO JOINTS – our skilled artisans use one solid piece of wood when handcrafting this stunning wedding band. 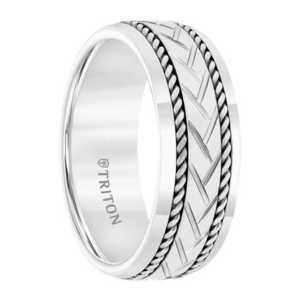 It is also protected against the elements with our patented RING ARMOR meaning it is safe to wear in water. 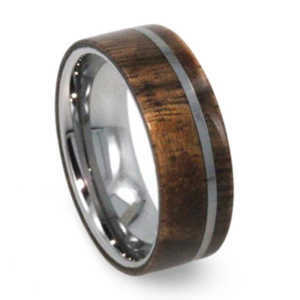 Note: This style comes from the Exotic Hardwood collection – the most prestigious of all of our collections – rings are made by hand, no two the same and all are made with exotic genuine wood materials. Each handmade ring in this collection is made from an un-cut wood band meaning there are NO SEAMS in the wood! There are no other rings on our site that are made with the care and precision as rings within the Exotic Wood Collection. 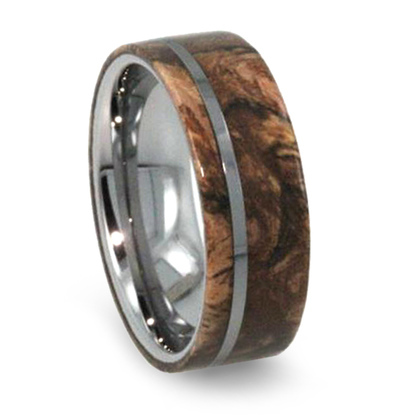 Please understand that the final product may vary in color from the ring as pictured in that even wood from the same samples and species will have lighter and darker grain and coloration. Please allow 4-6 weeks for handcrafted creation and delivery. RUSH ORDERS are available for a small additional fee – just give us a call!